Template Library - New template opens upload dialog – Welcome! How can we help? When I try to create a new template in the template library based on the Companies document template, Word does not open. Instead I get the 'Add a document' dialog. The SharePoint Document Template is missing or invalid. 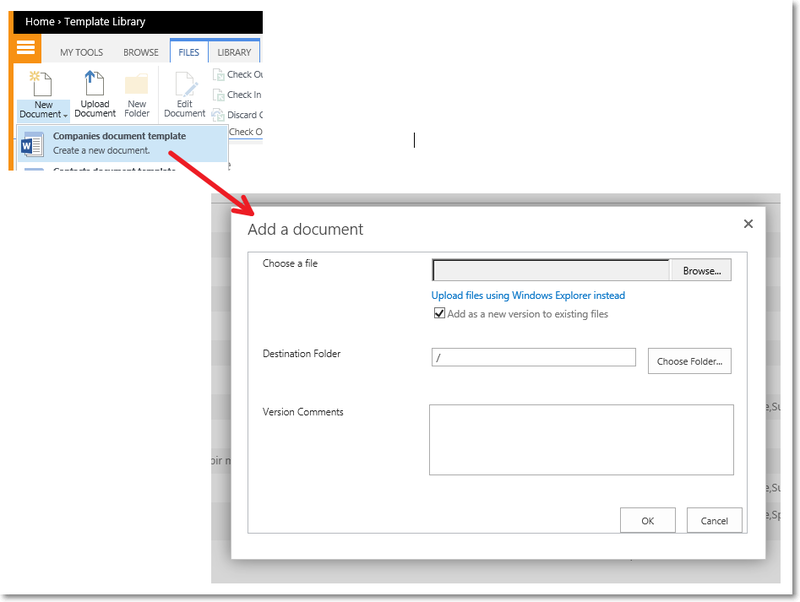 Check if a Document Template is available for the Template Library. 3. If the URL checks out OK, proceed to step 12. 4. If the Document Template does not exist you have to add a new one. 5. Open Microsoft Word and save a blank document as template.dotx. 6. Open Template Library --> Library --> Open with Explorer --> Navigate to the folder 'Forms'. NOTE! the folder 'Forms' is a hidden folder, and if it is not visible, you have to modify your Windows Explorer settings to allow you to see hidden items. 7. Add the template.dotx to the 'Forms' folder. 8. Open Template Library --> Library settings --> Advanced settings. 9. Set 'Allow management of content types' to No and click OK.
10. Open Advanced settings again and enter the relative path to the newly added template.dotx (Lists/Templates/Forms/template.dotx) then click OK.
11. Open Advanced settings once more and change the 'Allow management of content types' back to Yes and click OK. Your Template Library wil now work as intended.